Greetings from Southern Arizona, here in the Mule Mountains in Bisbee! I have included some pictures of my set up that I have inherited. I'm not completely new to solar, but my brain often turns to mush when I'm researching problems so I hope somebody can help me! As you can see, I have very thick 1/0 cable on my batteries and going to the inverter. I am looking to install a low voltage disconnect, set the disconnect voltage at 24.2/24.4 on my 24 volt system, to prevent the batteries from going below that overnight. See, my refrigerator is my main drain on this system, and it would be nice to be able to monitor the voltage just a little bit less often. I figure if the system turns off overnight, my fridge will only be off for a couple hours before the sun comes up and triggers the reconnect voltage. I hope this makes sense. I'd rather have the fridge shut off for a few hours than have my batteries drop too low overnight. The fridge is really the only thing plugged in and running overnight other than my Wifi router. So my questions are... what amperage does this low voltage disconnect need to be rated for? My charge controller is 40amps. I have this thick 1/0 cable but all of the LVD units I see aren't equipped for cable like that. Which one should I buy? Sometimes I feel like it's the wild west when trying to buy solar equipment resale. These forum threads on here have helped me out a ton already, and I hope I can get help with this too. The easy way, if your AC inverter has a programmable LVD setting (turn off at 24.0 volts, turn on at 25.0 volts or similar) would be good. And many of the newer inverters can have a remote On/Off switch--Just use a simple 12 volt relay to shut off the inverter. Putting a relay or timer on the AC output of the inverter--It is easy to turn off 10 amps at 120 VAC. The drawback is your inverter may use 10-20 Watts or more, and the refrigerator may average around 50-60 Watts--So the inverter "Tare" usage may be "significant" and just shutting down your fridge. If you are going with 24 VDC shutdown, then 10 Amps @ 120 VAC (1,200 Watts) turns into 50 Amps @ 24 VDC--A whole different animal. High current, and DC is much more difficult to "switch" (tends to sustain arcing much better than AC voltage). Somebody here found another source of better priced relays... Hopefully they will provide some more options. I do have a question--In general, if your battery bank is large enough and in good condition, it should easily run your refrigerator overnight--And should run it 1-2 days, without sun, down to 50% state of charge. Usually, you are not going to save much energy by shutting down at night--The next day, the refrigerator will just run a few more hours to bring the temperature back down to normal. Keep the refrigerator cool--The warmer it gets, the faster the food goes bad. For a freezer, cycling the temperature (i.e., from 0F (ideal) to 20F+), you run the issue of food degradation (0F and colder is better. Even 10F+, things go "off" sooner). And you run into the issue of increased chance of of "freezer burn" (water evaporates from the food and condenses on the freezer bag). How is your battery bank doing? Enough AH to run the fridge? Enough solar to keep your battery bank "happy"? Another thing to consider is the programmability of the relay/disconnect. If your bank capacity is limited relative to loads, the fridge startup surge current may make the DC voltage sag for a second or two, causing false relay trigger. To prevent this, the relay triggering should include the ability to set (eg) 10 second sustained low voltage before opening the circuit. Thanks you two for responding!! BB- My AC inverter doesn't have any settings. If I take it apart, would I possibly see settings for a LVD on the circuit panel? I appreciate this link and all of this info. I'll have to do some research on some of the terms that you used. I have sixteen 12v batteries linked together as a 24v system. When the sun is set, the battery level is at about 100% charge (25.4 volts). If I'm not careful, this will drop down to 24.4/24.6 by morning before morning sun, in the darker days of the year with the fridge running and lights on after dark before bed. Again, I came into this property with the setup the way it was. I feel like I would know more about this setup if I actually installed everything myself, step-by-step. To me though, I'm surprised that all of those batteries drain so much overnight from the few things that I use that require AC electricity. If I'm not super careful, I can easily see the battery level dropping to 24.0/24.2 overnight if I get super crazy and watch a long movie and run some lights after dark. Estragon- that is a very good point, and something I did not consider! You guys are awesome for taking the time to help me! With 16 x 12v batteries and a 24v system, that implies 8 parallel strings. My guess is some of the strings are being chronically undercharged. The undercharged ones lose capacity over time, and may well account for your drawing the bank down to 24v (~50%) overnight. If the batteries are flooded, I'd make it a priority to check water levels and test specific gravity of all cells. Some of the batteries may be goners, but it may be worthwhile trying to restore the weak ones by charging individually or in 24v groups of similarly weak ones. The ones that can't be restored should be taken out of the bank, as they will lead to bad charging of the better ones. It's generally very difficult to keep charging well balanced in lead acid banks with any more that 2-3 strings. With 8, this will almost certainly be an issue. A DC clamp current (amp) meter may be useful. We can do a paper design of the "ideal system" and compare with yours. What your daily loads are (Watt*Hour or Amp*Hours @ 24 volts per day). What is the size/configuration of your present array (good sun, no shade)? What is the AH rating of your battery bank (or the voltage and AH rating of each battery)? If the batteries are getting older, and/or have been "abused"... They will slowly lose capacity. Is your battery bank getting to ~14.75 volts every day? And is the voltage held for 2-6 hours (absorb stage)? What is the brand/model of AC inverter you have? Do you have its specifications (looking for "tare" load--Or how much power it uses just "turned on"). AC inverters tend to be cheap, and many folks (and dealers) tend to over size the AC inverter (bigger inverter than the battery bank can really support)... And large inverters can waste a lot of energy (larger/inexpensive inverters can take 20-40 Watts "just turned on"--And your fridge may average only 60 Watts--On a small system, AC inverters themselves can become a major load). Don't take the inverter apart... That will probably just result in a "dead" inverter. 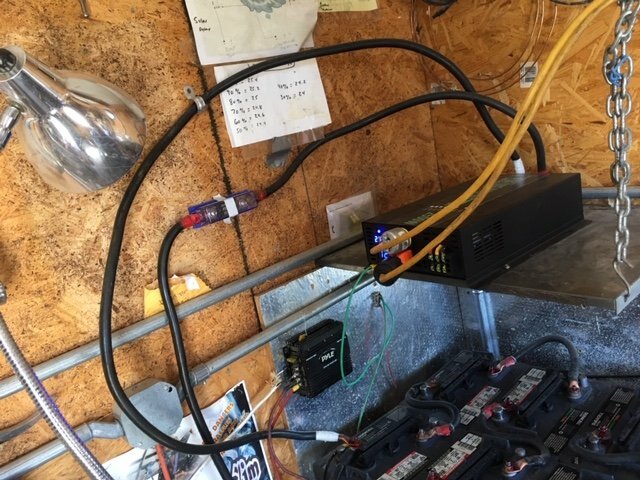 Getting a mid-quality AC inverter sized for your needs, and with an external shutdown or programmable LVD will probably be better than trying to "hack" your current AC power system. Hi guys. I have been on vacation. I really appreciate all of this information and I'm going to try to address these questions as well as I can. These batteries are 6 volt batteries. Considering what Estragon said, I thought it may be helpful to check the voltage of each battery with my volt meter. Right now, the voltage on the charge controller is 24.8volts here, early in the morning. When I woke up, it was 24.6. That was how low it go overnight with pretty much just the fridge running. By the time the sun set last night, it was down to 25volts. Each twelve volt battery is reading 6.21-6.23 right now, so that checks out. The water levels are fine in all of them. I hope this means, since the voltage level is roughly about the same on all of the batteries, that I don't have any goners. Yes I have flooded cell lead acid batteries but I don't think I have a hydrometer. I could get one though if it's important to have. I don't know my exact daily loads but I imagine I could find out. There's something that you can plug into a regular plug to see how many watt hours it draws that day, correct? I really don't run much at all except for that fridge, which is not quite a full sized fridge, but pretty close. Is my bank getting to 14.75v every day... hmm, 14.75x2 = 29.5v... well... it may get up to that on a really sunny day but it's definitely not holding that voltage for 2-6 hours. I didn't realize that I should getting up that high and holding for that long. I have an array with eight 130w panels. Perhaps that means that I don't have enough panels for my system? The inverter is a cheapo Chinese one... YueQing Reliable Electric, 2500 watt inverter, pure sine. Unfortunately I don't see anything about a 'tare' load. I really don't know how to figure out how many watts my inverter is using up. Each battery says "20 AH CAP" on it. I agree with you about getting an external, programmable LVD. I think that's how I started this whole thread... I just don't know which one to buy!! hahaha. Again, so much gratitude and love for this awesome forum community here! I hope all this will help other folks too, the way so many other posts have helped me. I would definitely suggest getting a hydrometer for flooded lead acid batteries. Voltage is a less accurate measure, and even more so with a battery being actively charged/discharged. A L.A. battery needs to sit with no loads or charging for a few hours to get a "resting" voltage indication of state of charge. With 8 strings of 20ah batteries, you have 160ah @ 24v = ~3.8kwh of total storage. A regular fridge will likely use ~1.5kwh per day. If it uses 0.5kwh overnight (with cooler ambient temps and fewer/no door openings), so about 15% of capacity. The tare load from the inverter may add another 0.3kwh or more overnight to the fridge load. You don't necessarily need to hold 29.5v for 2+ hours every day, but should do so regularly. Ahhh, Estragon, I imagine that's why my charge controller goes into the equalization mode, where the voltage seems to rise higher than normal, and is held there for several hours. I really appreciate all these stats and will go buy a hydrometer and learn more about it too. These kwh readings are super helpful too. In equalization mode (a sort of controlled overcharge), voltage should generally be ~31v for ~ room temperature batteries. This would be done maybe monthly or less often for an hour or two on an actively cycled bank. A hydrometer is very useful, as SG is really the only way to do EQ properly. Too much EQing needlessly stresses the bank. Too little can also reduce life expectancy. An EQ is done only after an absorb cycle has been completed. The ~29.5v charge is an absorb cycle, which is the latter stage of a normal charge. When the charging voltage has risen to 29.5, the bank is roughly 85% full. Holding it at that voltage for a few hours should get it to nearly full. Near the end of the cycle, the cells should bubble and gas a bit. This is less hard on the bank than EQ, but should be done more often. On a bank using say 15% of capacity / day with reliable daily charging, there may be some benefit to cycling between 70% to 85% daily, and to 100% weekly or so. With less reliable or limited daily charging, getting to nearer 100% every day possible may be better. Wow. There's so much that I'm realizing I didn't know/don't know still! Okay, so if my voltage is not reaching that 29.5v level on a daily basis, I then will assume that I'm just not pulling in enough from my solar panels. Perhaps it would be advantageous for me then, to add more panels to my setup. If I'm understanding correctly. Or, do I just need to make some adjustments to the settings of my charge controller? I'm looking into hydrometers right now. Much appreciated. Just an example of what the math looks like for a 1.5 kWH per day refrigerator freezer, on a 24 volt battery bank, in Tucson AZ. That would be 4x 6 volt @ 220 AH "golf cart" batteries in series (12 volts) by 3x parallel strands (660 AH) -- Or 12x "golf cart" batteries. 3,300 WH per day * 1/0.52 end to end system efficiency * 1/4.76 hours of sun (Dec) = 1,33nk3 Watt array for "December" break even. 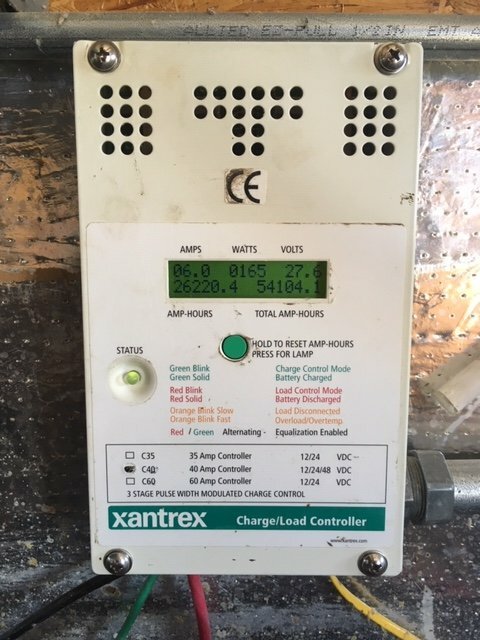 If you think, or have measured, lower energy usage, you can drop down from 3,300 WH per day to x,x00 WH per day... You have lots of sun, but it would still be nice to have ~2,486 Watt "nominal" array (happy batteries, less day to day "energy management", less or possibly no genset runtime).